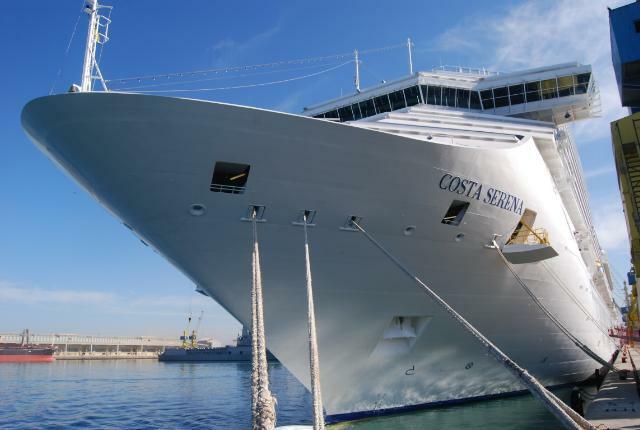 Here she is … the Costa Serena. And, first, a few facts and figures. She’s 290 metres long, and 36 metres wide. Captain Claudio de Fenza presides over 1100 crew and up to 3780 passengers spread over 17 decks. Feeding all these, in five dining rooms, are 117 kitchen staff, under executive chef Massimo Molinari. We are often asked how it compares with Costa Atlantica, on which we cruised three years ago, That’s a hard one to answer, because Atlantica was a hard act to follow. That ship was themed around the films of Fellini; this one’s based on Greek mythology, hence the drawings of naked gods and goddesses, generally having a good time, all over the place. The food, although not always Italian, was served on the Italian plan. Antipasto, pasta, segundo piatto, (main course) cheese and dessert. I did wonder why the cheese was served before the sweets … I assume the idea was to clear the palate before getting stuck into that (usually) sweet, creamy ‘fat-boy kit’! The itinerary was Savona, Barcelona, Casablanca, Funchal, Tenerife, Lanzarote and Malaga … these, I shall post more about when their turn comes up in the ‘Trip Diary’. But, after visiting all these ‘winter paradises’ … it was a shck to sail into Savona on the last day, and find it covered with … SNOW! Is this where you’re spending the holiday?? NICE!!! Maybe you can explain something to me: why do the Brits say ‘Happy Christmas’ and in the US we say ‘Merry Christmas’? Just always wondered. Wish it was! But, the cruise ended on the 19th … an Atlantic Islands one left Savona two days later, & would have been there for Christmas, but was way too expensive & fully booked anyway. The ‘Happy Christmas’ is something I hadn’t really thought about … I guess it’s something I was always brought up to say … like, always write ‘Christmas’, never ‘Xmas’. But (I’m guessing) in some parts of England, ‘merry’ is a euphemism for ‘drunk’, so maybe the answer has something to do with that. Sounds idyllic. I can’t believe you got snow on the last day. Hope you are having a lovely Christmas !! It was rather a surprise … especially as we’d been wearing shorts and t-shirts only 2 days before. Got some video of it, though, although not very good; mainly taken out of the window of the bus to Genoa. Wow… proper Italian meals on a cruise? Sign me up! I like the sound of that itinerary too…lots of open water. Merry belated Christmas and a Happy New Year too! Have a look at their website at http://www.costacruises.co.uk . Or, if you perfer the ‘paper’ version, your travel agent should have it. Prices are usually reasonable, but Costa usually quote ‘cruise only’ … but many UK travel agents can put together a flight/cruise package, if you need. But, be aware of the 6 euro per person/day service charge … it is mentioned,but we spoke to one or two people who took exception to it … personally, I think it’s much better than tipping everyone you come into contact with. A Happy Christmas to you too, and all the best for the coming year. May it be a fruitful, travel-filled one! I like the idea of having warm weather at this time of year – snow might be a bit of a shock if I’d packed my lighter clothes. It was freezing when we left London, so I had a heavy-duty fleece, woolly hat and gloves with me … fortunately. And, the staff at Genoa Aiport had the runway cleared in jig time; our flight home was only delayed by 20 minutes!